We are in the thick of summer heat here in the Beehive State. 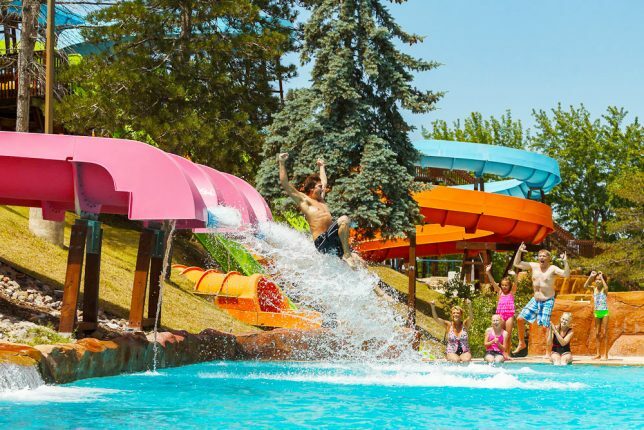 Cool off by visiting one of these five Utah water parks with family and friends. Seven Peaks: Located in Salt Lake City, Seven Peaks is a favorite for visitors of all ages. The amazing water park currently holds 14 slides and also has fun areas like Dinosaur Bay and the Amazon River. Cherry Hill: Kaysville’s Cherry Hill includes the Pirate Cove attraction that kids love. Parents can relax in the lazy river while thrill seekers will enjoy the Cardiac Canyon River Run. Cowabunga Bay: Head to Cowabunga Bay in Draper for colorful waterslides and fun in the sun. Kids will have a blast in the maze of water attractions while parents can ease into the zero-degree entry pool, take it easy on the lazy river or go crazy on the 11 waterslides. Layton Surf-n-Swim: Open year-round, this wave pool in Layton is a top attraction — and it’s incredibly affordable at just $4.50. Lagoon-a-Beach: Farmington’s Lagoon-a-Beach water park is the perfect place to chill off after a hot day of rides at the Lagoon amusement park. This water park includes hydro tubes, waterslides, waterfalls and a lazy river. For more ideas on fun ways to stay cool this summer, contact us at L&L Motor. We’ll gladly recommend our favorite sites to explore. Which 2018 Ford Model Gets the Best Gas Mileage?